Hills prescription s/d feline diet is carefully formulated to provide the correct nutrients and in the appropriate promotions to help support the treatment of cats with Urinary Tract Disease. Urinary tract disease in cats is often caused by the formation of mineral-based crystals and stones in the bladder and urethra that can cause discomfort, bloody urine and even life-threatening obstruction. In cats, crystals made up of struvite are the most commonly identified cause of urinary tract disease. A 156g can is equal to 50 grams of the dry food. Energy Increased Reduces food intake and thereby mineral intake. Phosphorus Reduced Decreases urinary concentration of struvite constituents, magnesium and phosphate. Target urinary pH Acid: pH 5.9-6.1 Increases the solubility of struvite. Beta-carotene High Helps neutralise free radicals to help combat urolithiasis. Poultry meat meal, rice, animal fat, maize gluten meal, vegetable oil, dried whole egg, potassium chloride, digest, calcium sulphate, salt, taurine, vitamins and trace elements, with preservative and antioxidants. Minced with Liver (26%): Pork, pork liver, animal fat, rice, maize starch, maize, cellulose, calcium sulphate, calcium carbonate, potassium chloride, taurine, iodised salt, dicalcium phosphate, vitamins and trace elements, coloured with iron oxide. Monitor the urine throughout dissolution and control urinary tract infection, if present. Urinary pH will increase if infection with urease-producing bacteria is not eliminated. Urinary pH must be acidic for successful dissolution. After initially feeding s/d™ Feline for 2-3 months, the recurrence of struvite-associated FLUTD can be reduced by feeding Prescription Diet™ c/d™ Multicare Feline or c/d™ Multicare Feline reduced calorie or w/d™ Feline. If FLUTD should recur when only c/d™ Multicare Feline or c/d™ Multicare Feline reduced calorie or w/d™ Feline is being fed monitor urine pH, check for urinary tract infection or re-evaluate the type of uroliths and crystals. Following successful dissolution of struvite, if cat is overweight or prone to obesity: Prescription Diet c/d™ Multicare Feline reduced calorie or w/d™ Feline. To control urate or cystine uroliths: Prescription Diet™ k/d™ Feline. 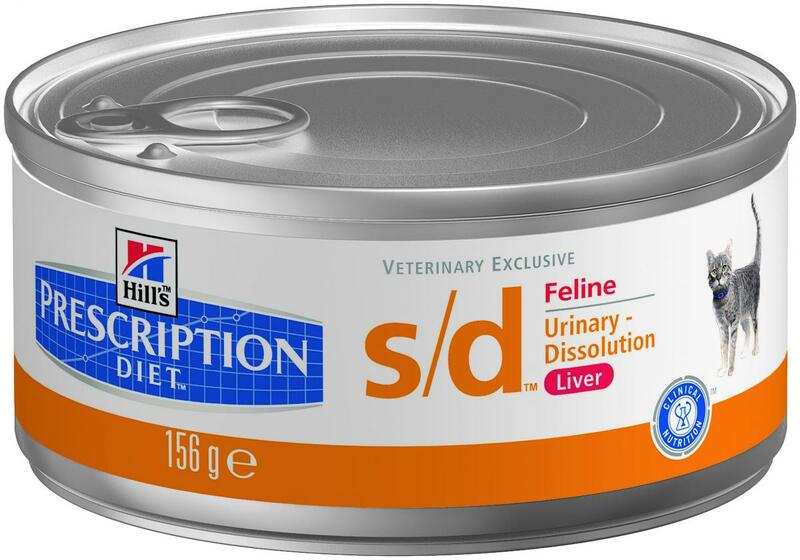 There are currently no questions for Hill's Prescription Diet s/d Urinary Care Cat Food - be the first to ask one!